Are you looking for a bedside reading companion for your bedroom? Perhaps you want a lamp to help you when you’re beavering away at your desk finishing up a project for work? Well, whatever your lighting needs, we’re sure one of the floor lamps we road test will plug that gap nicely. 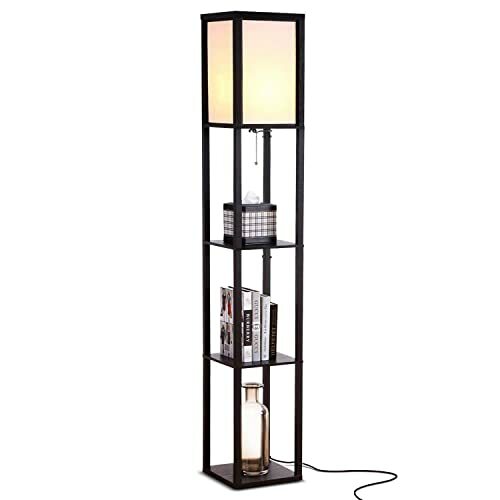 If you want the cost-effectiveness and energy-efficiency of an LED floor lamp combined with shelving space ideal for smaller bedrooms, the Brightech Maxwell delivers in fine style. Enabled for voice control if you get a smart speaker and outlet, choose from 4 great color schemes to mix and match with any bedroom décor. The Brightech Madison offers a fully integrated lighting solution with a nightstand, shelving and onboard USB ports for charging your devices overnight. 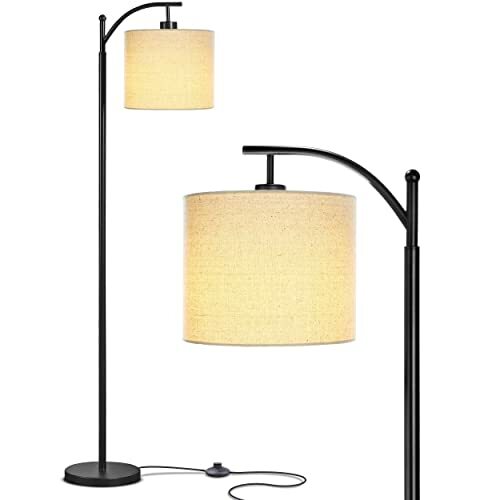 Another floor lamp with voice control capability baked in, the Madison will set off any bedroom a treat while providing all the lighting you need to curl up with your favorite book then switch it off with a simple voice command. For a traditional take on the floor lamp with a premium placed on design, the Adesso Oslo accommodates either CFL or incandescent bulbs. Invest in a smart outlet and you can streamline control a treat. 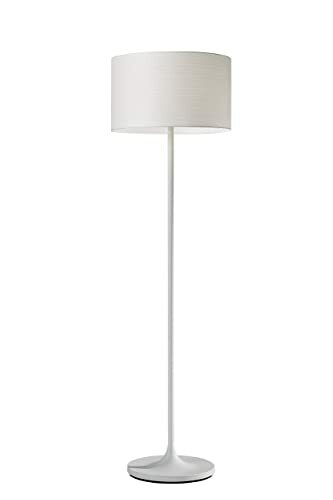 This is a budget floor lamp with top-tier performance in a devastatingly good-looking form. Now, before we get down to business with our brief capsule reviews of these lamps, we’ll drill down on how you can simplify your buying decision. Floor lamps in the bedroom can serve many valuable purposes. As well as the obvious lighting provided, they can also become a piece of furniture in their own right. If you’ve got a low-slung futon and a more minimalist aesthetic in the bedroom, a well-chosen floor lamp can add some valuable height and contrast. Versatile, movable and acting as the ideal accent piece, here are some simple pointers to bear in mind if you want to get the best fit for your needs. Think closely about what you want from your floor lamp first and foremost. Time spent here will make your buying decision easier and ensure you get the right lighting for the job at hand. If the lamp is acting as the main source of light in your bedroom, you’ll need to shoot for a larger model and look for a lamp that supports more powerful bulbs. If you’re only planning to use the lamp as an occasional reading companion or as a supplementary light, you can opt for something more decorative with brightness at less of a premium. Increasingly, LED bulbs are the benchmark in lighting. These bulbs are remarkably energy-efficient giving off the same equivalent brightness levels of traditional bulbs drawing down far more power. The added benefit of LEDs is that each bulb is built to last anywhere from 20,000 to 50,000 hours saving you money on replacements as well as running costs. Check that the lamp you’re looking at offers the type of bulb you prefer. Where will you put your floor lamp? Since trailing power cables make dangerous trip hazards, you’ll want to assess placement so you’ve got an outlet close at hand. 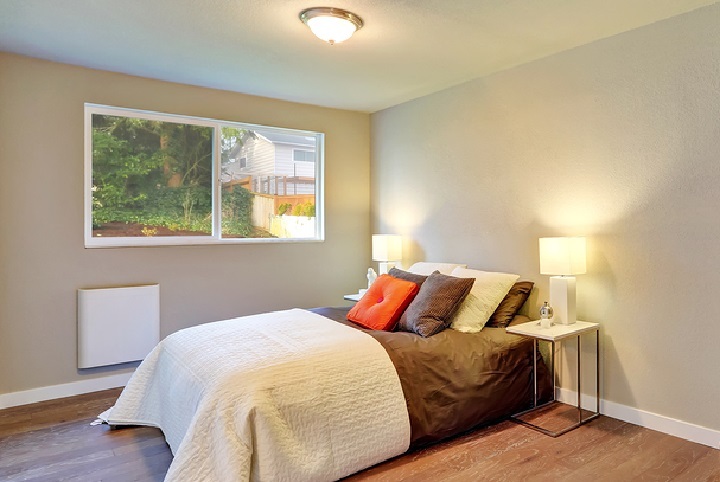 Make sure the power cord is cut long enough on the lamp you’re considering so you don’t end up needing to reach for an extension cord that will clutter up the bedroom. Lamps come in all shapes and sizes. Many offer a range of extras beyond the simple function of lighting. Rather than obsessing about a lamp packed with features for the pure sake of it, consider what you’ll actually use. Shelving is a neat addition for smaller rooms where you can take advantage of this for either displaying knick-knacks or stashing your bedside reading material. USB charging ports help you keep your chargers off the floor and your cell phone close to hand if you need it during the night. Many contemporary lamps also allow you to use voice commands to switch them on and off if you invest in a smart outlet along with a digital assistant like an Echo device or a Google Home smart speaker. While we list styling last, it goes unsaid that the looks of the lamp you’re considering are key. Make sure you don’t opt for form over function but take the time to choose a lamp that fits well with your existing bedroom décor. 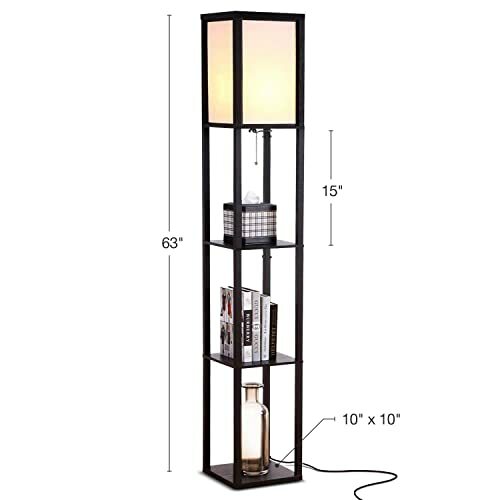 If you’ve got a smaller bedroom, this floor lamp boasts inbuilt shelving so you can max out that space with plenty of books to read by lamplight along with ornaments. Whether you use the triple-tiered arrangement for storage or display, it’s a real space-saver. The LED bulb gives off a soothing, warm glow perfect for the bedroom and lasts up to 20 years for maximum energy-efficiency and cost-effectiveness. Available in 4 colorways, there’s something to match all bedroom décor. As an added bonus, this smart light works with your preferred digital assistant if you have the requisite smart outlet sold separately and an Alexa or Google Home device. Another Brightech up next with the Madison. This all-in-one table and lamp means you’ll never smash your light to the floor again as you fumble in the dark. If your room is a mess of charging devices, keep your phone and tablet close to hand and charge them on the table with the provided USBs ports. As with the Maxwell, the Madison comes enabled for voice control with either Google Assistant or Alexa. All you’ll need is a pocket-friendly smart outlet and smart speaker. Traditional styling comes with integrated shelving so this makes another great multipurpose approach to bedroom lighting from an expert in the space. 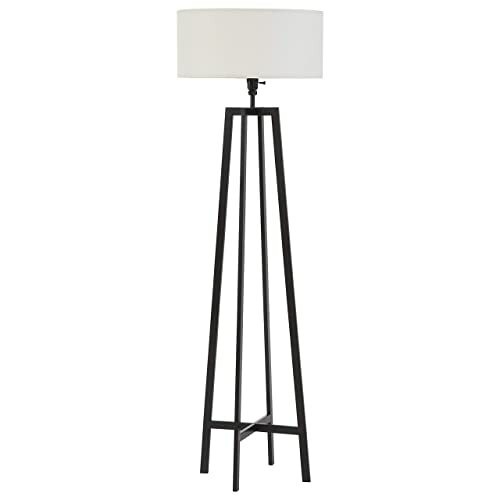 Next up is a more traditional floor lamp from Adesso. Finished in matte white, the styling works well in both minimalist lofts and more traditional and chintzy bedrooms. The understated shade is finished with patterned paper that has a subtle pattern accented when lit. Compatible with both CFLs and incandescent bulbs, there’s no bulb included so roll with what works best for you. Smart-outlet compatible to streamline control, you’ll get a classic look combined with 21st century tech for the double-win. To ice the cake, this floor lamp comes in at a remarkably keen price so it’s great if you insist on quality but you don’t want to bankrupt yourself buying a bedroom lamp. It’s impossible to ignore Brightech’s stranglehold on efficient, affordable lighting and the Montage is yet another home run. 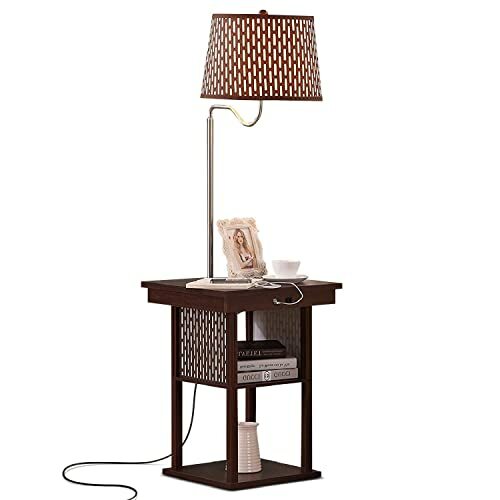 This standing lamp works effectively if you want to read in bed and you can position it to angle the light just where you need it. The design is neutral enough to mesh with any décor so it makes a versatile addition to any home. With an energy-efficient LED bulb good for 20,000 hours of use, get the same intensity of lighting as incandescent or halogen bulbs without the stiff electricity bill or environmental footprint. As with all Brightech lamps, you’ll enjoy robust warranty coverage for a full 3 years. 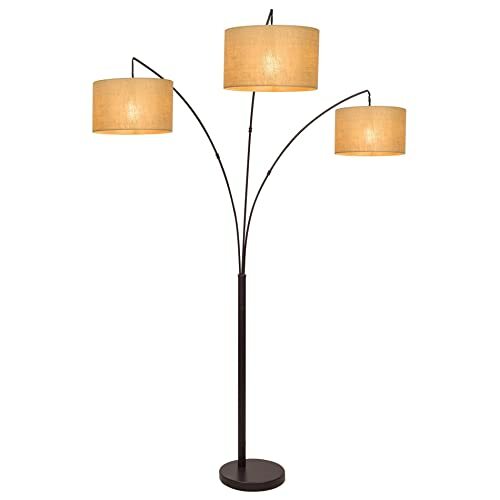 Something striking and different next with this triple-pronged floor lamp from Kira Home. You can tweak the lighting so one, two or all lamps fire into action so you get an elegant alternative to a regular dimmer. 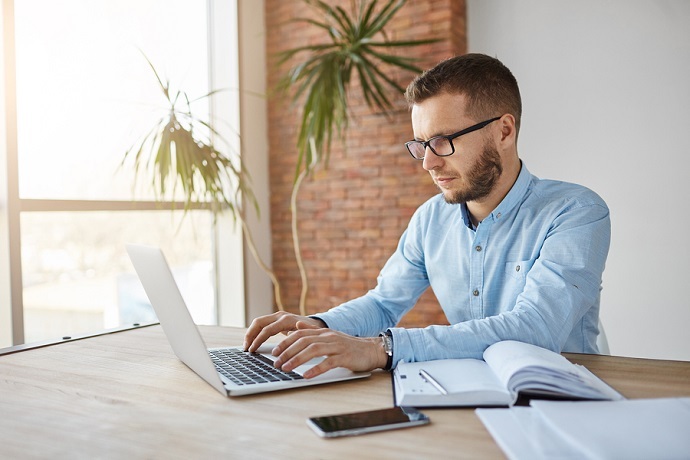 All arms offer multi-directional lighting so you’ll get the level of brightness you need whether you’re working away at the bedroom desk, reading in bed or just waking up in the morning. Choose from LED, CFL or incandescent bulbs for maximum flexibility. Be aware that bulbs are not included so you don’t end up disappointed. Brightech’s Emma is a retro lamp with a tripod arrangement of wooden legs finished in birch or walnut and crowned with a subtle white shade. Hook this lamp up to a smart outlet and you can control it remotely in-app on your smart phone or using voice control and your favorite virtual butler. Cut 10-feet long, you’ll have more than enough play in the power cable not to need to call on an extension cord. That said, it’s not so long it will become a trip hazard either. The energy-saving LED gives out 3000 kelvins of warm light perfect for the boudoir. Our penultimate lamp is this shelf-equipped beauty from Catalina Lighting. The metal build gives you maximum lifespan and the distressed iron finish means it looks great into the bargain. The linen shade adds a dose of texture to an otherwise utilitarian aesthetic. A pair of small shelves works well for display or storage purposes. Taking a regular 150-watt or the equivalent LED, you’ll get a nimble and space-saving lighting solution at a very competitive price. What’s not to love? 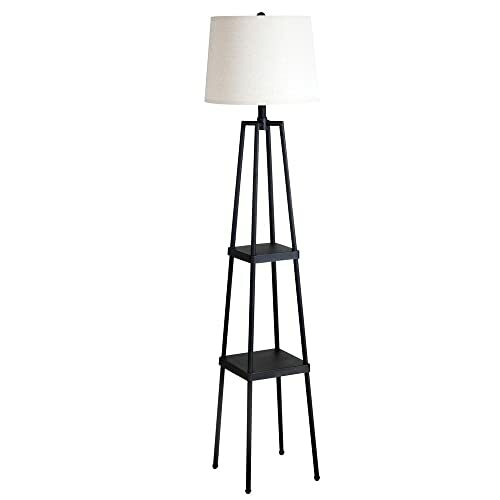 Last but not least, Stone & Beam serve up this black metal floor lamp that makes a neat fit in the bedroom. With an art deco leaning, the monochrome contrast and juxtaposition of metal and linen make this lamp a real statement piece. You’ll get an energy-efficient LED bulb bundled. With straightforward assembly, you’ve got all you need thrown in to be up and running in minutes flat. If you’re looking for a space-saving floor lamp that doesn’t compromise on design or performance, pop this Stone & Beam on your shortlist. 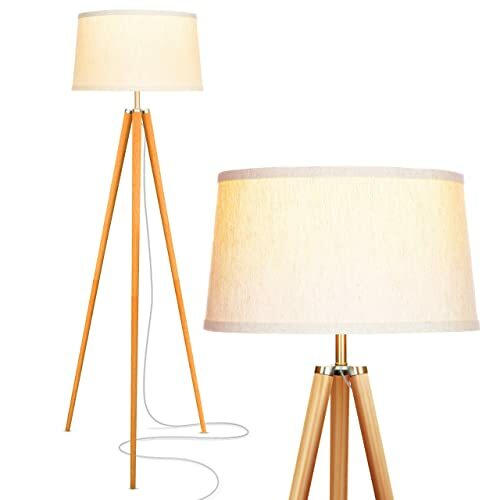 We hope you’ve now got the best floor lamp for your room firmly in your sights. Once you’ve determined which type of design works best and whether you need additional storage, you’re really just left with the bulb type to consider and you’re away laughing. Drop us a line and let us know how you get on if you opt for any of the lamps we reviewed today. We love to hear from our readers, especially with first-hand experiences of the products we’ve tested out for you to make your lives easier. Come back soon as we’re heading back into the kitchen with some more great rice cookers!